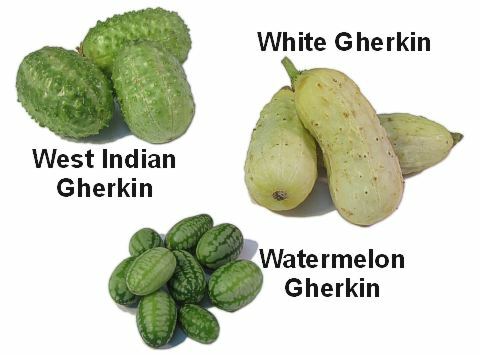 General Information: Gherkins are traditionally pickling cucumbers and come in all shapes and sizes. Some varieties are very familiar: baby dills and French cornichons; others are more nostalgic like the Kirby cucumber. Most Gherkins are petite cucumbers about 2 inches long - sometimes allowed to grow up to 4 inches in length. American pickling cucumbers have knobby warts or spines and skin colors that ranges from white to deep, dark green. Pickling cucumbers are characterized by a mild flavor, a solid crunch, evenly distributed juiciness and a lingering sweetness with little bitter after taste.